How Would You Design Your Perfect Lamborghini Urus? With the live configurator, you can sample how the one-percenters lives. Any time a new supercar gets revealed, the car community goes nuts over which YouTuber is going to order the nicest "spec." Unfortunately, since most of us will never have the means to buy one of these cars, we just have to grin and tell people that their horrible taste is good and move on with our day. Luckily, supercar manufacturers like to include us regular folks in the fun, and have been releasing online configurators for new models and . The latest configurator is for the Lamborghini Urus, and it is now live. The Lamborghini Urus configurator may not be the most extensive, but it does let you choose from a nice selection of customizable options. Unlike some configurators, this one doesn't give you a price for your final creation, which is probably for the best. We know that it's easy to go nuts with the options sheet and fill a car with options that . The Urus configurator starts by giving you seven base configurations on which to start designing your dream SUV. Each is a bit different, but basically act as a starting point that can be completely changed if desired. We started off by building a nice red Urus with Rosso Anteros paint. We decided to pair the red paint with a Bianco Polar interior for a classic '80s look that a Lamborghini Countach would be proud of. Even though the Urus will be the brand's most practical model ever, we went for the four-seat configuration because this is still a Lamborghini after all. We also went for some options such as Bang and Olufsen sound, a head-up display, night vision, hands free tailgate and front and rear heated seats. We decided to leave off things like the Urban Road and Highway Assistant packages. The configuration code for our red Urus is AABX06 if you'd like to build one like ours. Even though Lamborghini models are supposed to be mad and attract attention, this is still an SUV. In addition to our red Urus, we wanted to make one that was more discrete. For our sleeper SUV, we decided to go for the Grigio Lynx paint with a slightly flamboyant green brake caliper. On the interior we stuck with conventional black leather, but gave it a touch of excitement with green stitching. The configuration code for this Urus was AABX8G. Have fun building your dream Urus, and let us know how you configured your car in the comments. 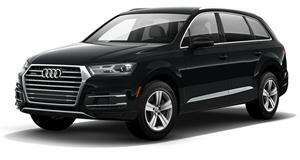 Audi's Q7 continues to be one of the finest large luxury SUVs on the market. With a 6.0-liter V12 TDI that's available for Europe only, US buyers are offered instead a 3.0-liter TDI with up to 225hp and 406 lb-ft of torque. A 3.0-liter supercharged gasoline V6 is also available. Cons: Body style not for everyone. Pros: Pretty much everything else.